Jim Cowan, professor of oceanography at Louisiana State University, has analyzed many of these diseased fish. "When one of these things comes on deck, it's sort of horrifying," Cowan said. "I mean, there these large dark lesions and eroded fins and areas on the body where scales have been removed. 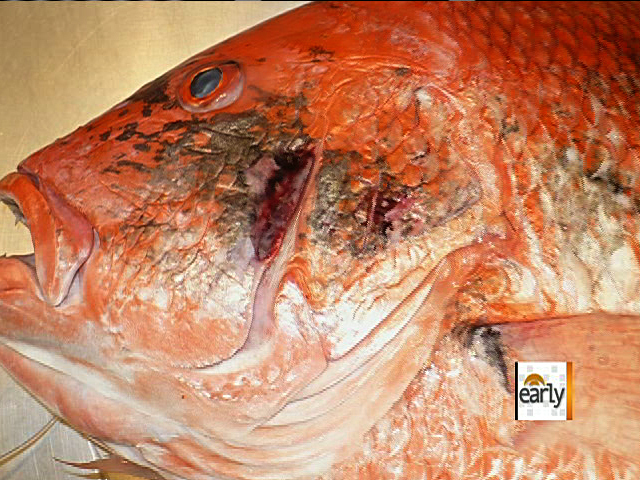 I'dimagine I've seen 30 or 40,000 red snapper in my career, and I've never seen anything like this. At all. Ever." Cowan can't say with certainly the cause of these lesions. Cowan said, "We think from chronic exposure to some environmental stressor, and I think the likely assumption that it has something to do with the spill is there." But the 200 million gallons of crude spilled from the Deepwater Horizon last year is at the top of the list because the highest rate of sick fish are being found in the areas of the Gulf that were the most affected by the oil. "This whole issue seems to be centered between Galveston and Panama City..." Cowan said. "In fact, almost 50 percent of the red snapper that we caught on some of these reefs had had these secondary infections." These so-called "hot spots" are of particular interest to University of South Florida researcher Dr. Steve Murawski. Bell caught up to him on the choppy waters 11 miles off the coast of Pensacola, Fla., while he conducted his research. Murawski said, "What we're going to do is establish a baseline for fish disease. So, even if we don't find any potential pathology now, we can go back two or three or four years from now and see if there was some slow time bomb that was going off." This is the first comprehensive study ever done on the health of fish in the gulf. During the six-week study, Murawski will catch and examine more than 4,000 fish. He said, "It's going to important for this spill, but it's also going to be very important for the next oil spill that happens in the Gulf because we'll have this baseline." But it's the bottom line that worries Frank Patti, owner of Joe Patti's Fish Market in Pensacola, so he prominently displays where his fish were caught. Patti said, "We still have customers that want to know where the product comes from." The majority of his fish are not from the Gulf of Mexico. Cowan said, "We're in no way trying to infer that this is a human health issue. I can assure you that none of these fish are reaching the markets." While consumers need not panic, Lucky Russell worries whether there will be enough healthy fish for him to make a living." "If our fish are polluted, nobody's going to get to go out there and catch fish it," Russell said. When asked if he's worried that might happen, he replied, "It very well could." "Early Show" co-anchor Rebecca Jarvis added on the broadcast that the number of sick fish in the Gulf depends where you go. In areas not affected by the oil, it's one percent or less, and even in some hotspots only two percent to five percent of the fish are sick.